Will there be a parade in Philly in February? There's no longer much of a jinx effect to discussing the prospect of a Philadelphia Eagles Super Bowl title. A 10-1 record puts you in the ranks of a season's championship caliber teams. You're only jinxing it if you make foolish guarantees, like this fan who got the next three years worth of Super Bowls inked on his upper arm. The sports world is starting to anticipate the frenzy of a parade down Broad Street in February, from ESPN the Magazine to Al Michaels in the announcer's booth. They were both enthusiastic about what such a scene would represent for Philadelphia. But then there's Slate, no doubt a popular website that nails current affairs and culture with appreciable depth. They also have one of the most entertaining advice columns/podcasts in the business with "Dear Prudence." 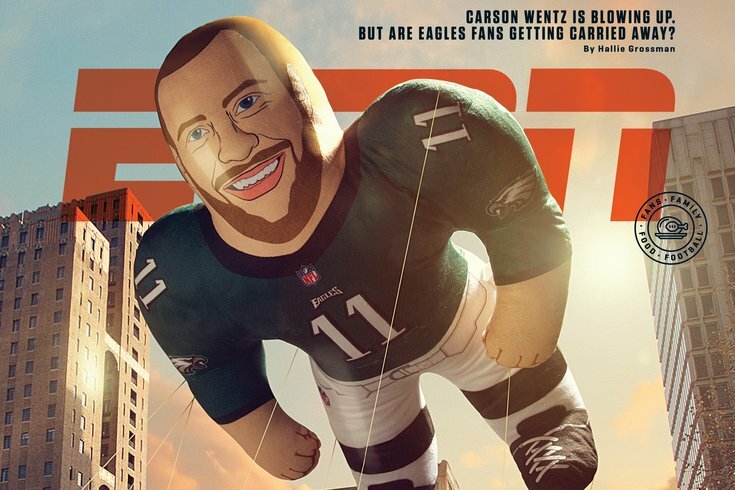 How about this take on Philadelphia's potential Super Bowl parade, though? "Bad News for Philadelphia: The Eagles’ Super Bowl Parade May Disrupt Some Great Events," reads the headline. Seriously? Bad news? This totally hypothetical parade is right up there with hell freezing over and the Second Coming, as far as nearly everyone in this region's lifetime probabilities are concerned. And Slate is worried we will have a tough day of traffic if a parade is held on Tuesday, Feb. 6. While [the Eagles'] success is a feel-good story for Philadelphia, it’s not all gravy for quarterback Carson Wentz and company. Sadly, the team’s 2018 Super Bowl parade will cause traffic jams throughout downtown Philadelphia and may call for the postponement or outright cancellation of some great events in the city. Nothing will be done "sadly" in Philly the day the Eagles win the Super Bowl, first of all. With all due respect to the events mentioned — "The Humans" at Walnut Street Theatre, Brent Fayaz at the Troc and the four-day IICRC Certified & Approved Applied Microbial Remediation Technician course — these are not things that, you know, have never happened before. It's entirely fair to consider what the implications of a parade would be for SEPTA and the majority of the working world. Tons of people would skip work or plan to leave early, and possibly not show up the next day. This would be, as many have remarked in years past, the city's most glorious celebration since the signing of the Declaration of Independence. If you really want to raise concerns, public drunkenness and vandalism are much more legitimate issues, especially if Bud Light is paying for the beer. Destructive people who would dare to ruin such an event aren't going to be embraced by the rest of a city looking to bask in the rarified air. This would be something you want to remember vividly for the rest of your life. Any and all acknowledgment of Philadelphia's cultural life outside of the Eagles is more than welcome, but does this not come across as a strained suggestion that football is somehow a lowbrow mob nuisance? Parades are so disruptive, why bother? How many times have Boston or Chicago suffered because of a championship parade? "We had an absolute blast, such a remarkable display of unity and pride, but the traffic and event cancelations honestly made it not worth it in the end," said the oft-quoted no one. Let's let the Eagles take care of business before we worry about the logistics of an unscheduled event more than two months away.